Designing a Letter Writer, Access Macros, Events, OnDblClick Event, Refresh Macro, Much More. 65 Minutes. In this class we will begin designing our Letter Writer system. With our letter writer, we'll be able to actually type letters and other correspondence into our contact management system and print them out in a letter or memo format to mail or fax to our customers. 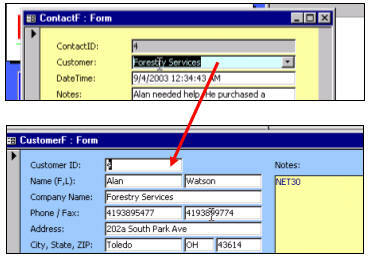 We'll begin by developing a query that only shows the current contact record. We'll use this query to feed our report that lets us print out the letter. We'll use the technique we learned in a previous class to get the Contact ID value from the open contact form. Now that we have the query built, we can build the Contact Letter Report. We'll format this report to look like a normal letter, with the customer's name and address and the body of the letter ready to mail. Next we'll place a Print As Letter button on our form so that we can print the letter right up. We'll learn about what it means when records are Dirty - or in the process of being edited, and how this hurts our database... we can't directly print a letter now until we manually save the data to the table. We'll need something more powerful. In lesson three, we'll begin to learn about Macros. We'll make a couple of real simple macros just to teach you how they work - and how we can make them repeat automated tasks. We'll make a simple macro just to beep at you. Then we'll make a macro that's a little more complicated. 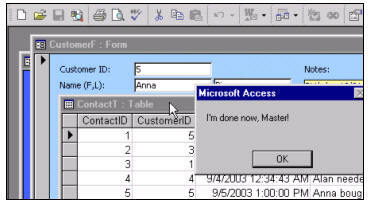 It will open a form, beep, open a table, and then tell you "I'm done now, Master!" 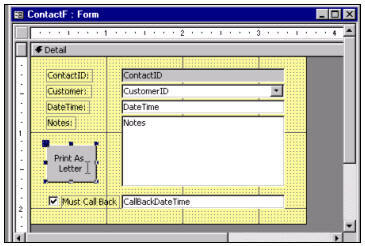 Next, we'll make a macro that will allow us to open up the current customer record from the contact form. We will assign this macro to the On Dbl Click event (on double-click) in our customer combo box. This means the user just has to double-click on the combo box to open up that customer. Real powerful stuff! Now that we've learned about macros, we can actually make a macro to refresh the current contact record before printing it - assuring us that the data is saved in the table before printing. We'll learn how to make a command button that runs a macro. Once we're done with the macros, we'll actually get into making our letter report look good. We'll start by making some new fields to concatenate our name fields and address fields together. 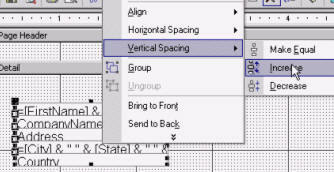 We'll learn how to automatically adjust the vertical spacing of fields on our forms and reports. We'll talk about the margins of the page, and making sure you set the report at it's optimal width. 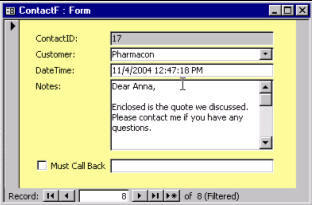 This class begins to take our contact management system and use it for correspondence as well. We'll do more with this in coming classes - including a mass-mailing form and letter as well. We also begin to learn about Macros, which are the stepping stone to Visual Basic programming. Don't miss this course! Richard on 1/1/2007: Designing a Letter Writer, Access Macros, Events, OnDblClick Event, Refresh Macro, Much More. 65 Minutes. sasson cohen on 4/13/2008: do we have an index/list for reviewing each theme on each class ( maybe to support our design )? I have tried everything that I can think of to stop decimals from rounding out to whole integers. Is there hidden code somewhere? Richard Rost on 9/8/2008: Margaret, that all depends on what you're doing. I need more information to go on. What type of FIELD are you working with? Number? If so, did you format it as an INTEGER or LONG INTEGER? If so, that's your problem. Elsa on 10/27/2008: Hi Richard, How do I format only a few words within a concatenation in a report textbox? Example: "Your balance is:" & "[Balance]" I want [Balance] to be in bold and formatted to ##,###.00 while the rest of the concatenation stays the same. Thank you for your help. I am currently at 223 but will keep going. Does MS Access 2003 and earlier have the functionality to bold a portion of a concatenated string in a report textbox? Richard Rost on 11/23/2008: Elsa, nope. You can't change the format of PART of a textbox string. Greg Paradise on 2/18/2009: I'm using 2000 version and the Refresh from the run command will not run, I get an error that says this version does not support the function. Do I need to have my cd in? I have been doing the Access course with you at 599cd which is helpful. I have a question. I have a table that I have imported from an excell sheet. Only 2 fields. (Stock code and Suppliers part number. Some are a 100% duplicate (eg stock code and Suppliers pat number) and others have the same stock code but no suppliers part number. I want to keep the record with the most amount of information, Eg both stockcode and suppliers part number. Eventually I want to make a new table out of the sort. I was thinking of using a query or a macro but not sure how to go about it. Can you point me in the best way to do it? Thanks Richard. Robert Fitzgibbons on 2/8/2011: I cannot open http://www.599cd.com/access/204. I get the "page cannot be found error meaasge". Any suggestions? Robert, is that a link in the video? If so, and you're looking for the student databases, they've been moved here. Robert on 2/23/2011: I have written a query which sorts my database according to appointment time. But the report I have developed based on this query sorts differently which is very annoying. I can’t seem to tell the report how do sort properly. Any advice? A report will override (or sometimes ignore) your query's sort. You have to use a SORTING AND GROUPING LEVEL in your report to force the sort you want. That's covered in Access 104. What is the reason for adding the default value in the customerID combo box? Alyson on 3/21/2012: Hi. 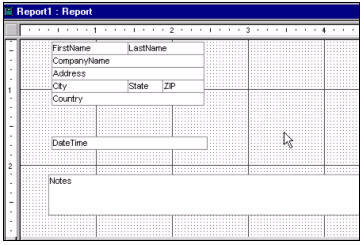 I'm using Access 2010 and when I click to create a report, it pulls up tables automatically...not queries...the only way I've found to use a query to feed a report is if I click the query and use the report wizard. Is there a way around this? Alyson on 3/21/2012: Sorry for so many questions...I built my query and report like you did...now when I go to the query, it won't show my information...it looks like a blank page, but when I go to design view, it's all there...what is going on? Alyson on 3/22/2012: Ok, to say my problem correctly (lol) I built my query and then a form from the query. When I change from design mode to form view, it appears as a blank page, but when I go back to design view of the form, everything is there. I can't move on from this point due to this problem. I hope it makes more sense this time :) Please help! You have to make sure that you set the CanShrink property for the CONTROL and the SECTION the control is in to YES. You also have to make sure that there aren't any other controls on the same horizontal line with them in your report. For example, if you place a label or a vertical line that is next to them, that will also keep the report from shrinking. Finola B on 11/12/2012: Thanks Richard, I did that but it doesn't get rid of the entire field, I still have an empty line in the middle of an address. Access is able to do it on its Labels Wizard, ie move lines up so that there are no empty gaps, but I don't know how to do it on my generic letter. I would have to see your report to tell you exactly what the problem is, but that's all you SHOULD have to do. As far as leaving a country blank... just don't type anything into the field. There isn't any special trick. Then, if it's on a line by itself in your report, and its CanShrink property is set to yes, it should effectively disappear. I'm getting this error message while trying to save the Macro(there is no time index listed); "An expression you entered is the wrong data type for one of the arguments... blah blah .." I'm using Access 2010. I then clicked on the OK button and came up to the screen "Macro Single Step." Am I doing anything wrong? Thanks. I need more context. What exactly are you doing? I'm getting an error message on Windows 7 Proffessional 32 bit. It has been working okay but the past few days, when I tried to run any of the downloaded file (AC2* series) it's giving this error message "Your MS Office Access (2007) database or project contains a missing or broken reference to the file 'comdlg32.ocx' version 1.2." I googled and so far no luck. Any suggestion. 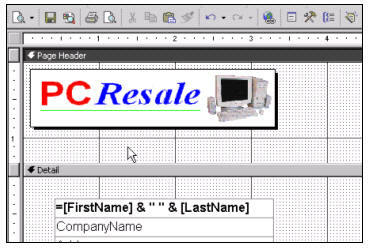 The file opens but when I click on any of the menu buttons from the PCResale.NET Main Menu or any Menu button from within the Form file does not work (meaning the button does not open" or do anything at all. Any suggestion? It was working at the beginning for the past 2 weeks. You may have a different version of COMDLG32.OCX on your system. You could try to download an updated version, but here's an easier fix... instead of messing around with files, just create a blank new database in 2007 and then IMPORT all of the objects from my download databases (tables, queries, etc.). That should then use YOUR comdlg32.ocx file. Let me know if this works. Vannak Hou on 12/31/2012: Index Time: 04:50-05:08. "The expression On Click you entered as the event property setting produced the following error: Ambiguous name detected: PrintLetterButton_Click." I even changed/modified to a different and still get the same error message." Any suggestion? You've got the same name used twice in your database. Vannak Hou on 12/31/2012: Using Access 2007. Where is the Format option in the design menu. Time Index: 04:48-05:35. I do not see the "Format" option on under the menu. I'm using a computer at work that has Access 2007. At home, I have Access 2010. Most of the time I am accessing the site from my work place computer. I have to admin that I don't still have a copy of Access 2007 installed on any of my machines, but in both 2010 and 2013, when you select objects on a report in design view, you get a REPORT DESIGN TOOLS section of the ribbon. All of the commands I mention in the video are available on those tabs. You can also right-click on the report objects. vannak on 12/31/2012: Hmmm ... I thought I had given a different name file as well but I'll do it again. vannak on 12/31/2012: Yes, I did download a few of the comdlg32.ocx off the sites (Microsoft and a few others, still no luck). But, i will try with your suggestion and let you know. I'll let you know because that computer or machine is a once in a while I do get my hands on it. But I will definitely save your suggestion on my e-mail and when I get my hands on it, I'll do it. As a suggestion for others as well, you might want to post this suggestion that you wrote and post on the blog somewhere. Unfortunately, I haven't used any of the blog on this forum yet. Once again thanks, Richard! vannak on 12/31/2012: Thanks for the reply. Didn't expect you would reply this soon. Sorry to bother you on the late night e-mail. lols. I'll find out later where the FORMAT option is located and I'll let you know. Thanks again Richard. Robert Fitzgibbons on 1/6/2013: I have an access database which keeps track of patients and referring physicians. There are 3 tables, and numerous other objects to manipulate them. The primary key on the contacts table (referring Physicians) is an auto number that links to the patients table( patient demographic data) and the patient encounter table (each individual appointment) Several months ago, I made some changes to the database to improve is functionality and renamed the file new office management. Unbeknownst to me for some strange reason my secretary continued to use the old database for referring physicians adding new contacts and editing old while using the new one for everything else. . This comes under the heading of not being able to win for loosing. The simple solution would be to delete the contacts table in the new database and then export the old table into the new database. However when I try to delete the contacts table in the new database, access warns me about the relationships I might be destroying. My question is, will it work if I simply duplicate the relationships as they currently look in the new database? You can go into the GLOBAL RELATIONSHIPS, delete the relationships, import the new table (replace the old one if needed) and then re-create the relationships. This will not cause any loss of data. It will work provided that all of your IDs match up. You probably have a CASCADE DELETE in place that's causing the warning. Robert Fitzgibbons on 1/17/2013: This worked great. I did it about a week ago and have held off on my reply to make sure there were no bugs. But the database is working perfectly. Thanks a lot. Richard Shafer on 3/2/2013: The macro apparently does not work in Access 2013. When I follow all that you do, it only opens the first customer of the customer form. I am putting in =[Forms]![ContactF]! 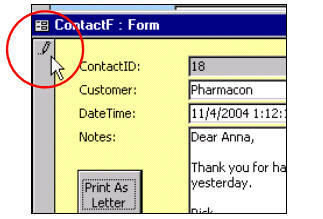 [CustomerID] and no matter what contact record I am on on the ContactF, it only opens up the ver first customer on the CustomerF. Is this different in Access 2013 or am I doing something wrong? I'll be addressing this issue shortly. Rick Shafer on 3/3/2013: Bah... No need to address this. I got cocky and thought I could follow along as I was watching the video. It was the part where you intentionally only put in the part of the equation... =[Forms]![ContactF]! [CustomerID] so that you could show that the macro field needs both sides of the equation [CustomerID]=[Forms]![ContactF]![CustomerID]. If I had just watched a few more seconds I would have been given the answer. I was just caught up on why it was not working for me. :) Ooops. Learned my lesson to watch FIRST, then try and re-create the information. However, I won't soon forget that macros require the full equation. Ah. You're right. I should have remembered that, but it's been almost NINE YEARS since I recorded that video (release date Sept 2004). I'll be revising it soon... working on Expert 2 now which is the equivalent of 202. Yep, of course. I show sending email using Outlook in a couple of other classes, plus I have an EMAIL SEMINAR coming up soon which shows you how to send email without using Outlook.